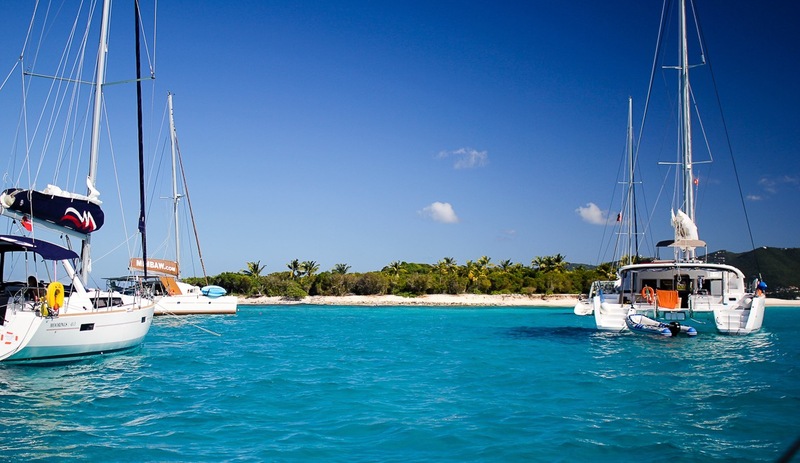 BVI is known as a sailing heaven and I am ashamed to say it, but I haven’t even sailed once since I have been here. The new year has just started so let’s try something new! 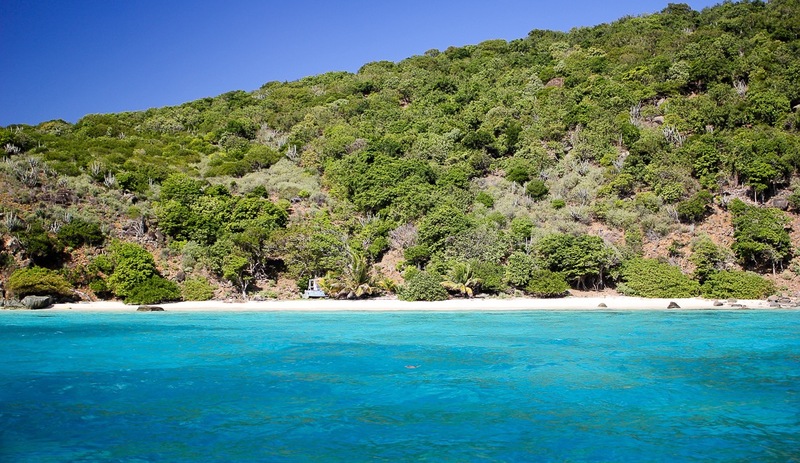 What about a weekend sailing trip to the eastern side of Jost van Dyke! 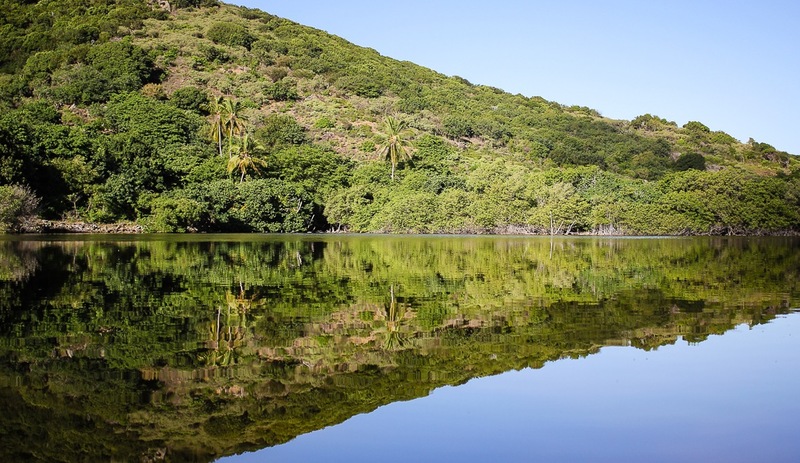 Some of the most beautiful locations in the BVI are only reachable by boat. I have a gorgeous view from my home, looking towards the bounty islands Jost van Dyke and Sandy Cay. It seems so close but it is yet so far. Seeing the boats passing and tourists enjoying the spectacular beaches just across from me reminds me to explore more of the outer islands. Luckily we have a friend with a sailing boat. He invites us to come along for a weekend. The weather conditions are great for the upcoming days so we decide to go the next day. My preparations for the trip are taking care of the food and drinks. As always I slightly overachieve and bring a bit to much. We set our sails towards my dream island: the most beautiful tropical place I have ever been. Too bad that Mr. Rockefeller thought the same thing and snatched it away before I even knew it existed. How unfair! Because of my nagging, or most probably some other reason, the Rockefeller foundation transferred ownership to the National Parks Trust of the Virgin Islands. Since 2008, everybody can enjoy this picture perfect island. Sandy Cay has a special memory for me as this was the first stop on my wedding day. The island has a short hiking trail. The middle of the island has a small salt pond. Who knows if there are any treasures buried here? No doubt that the pirates must have been here. Argghhh!! Tip: make sure to bring a good repellent if you like to go for a hike because there are a lot of mosquito’s. Next, we have to find a spot to stay for the night. We park the boat next to Diamond Cay, close to the shore of Jost van Dyke. We are lucky to have one of the last moorings right in front of Foxy’s Taboo. Tip: Bring your snorkeling gear along. 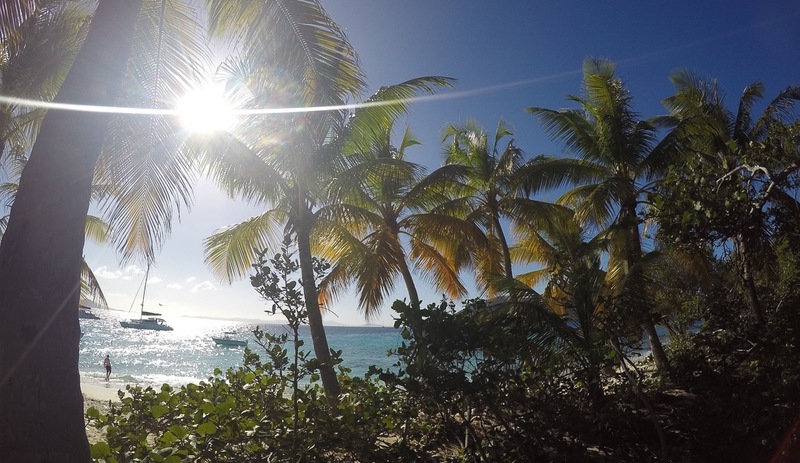 Diamond Cay is one of the best snorkeling locations to spot eagle rays, turtles and lot’s of other fishes. The best time of the day is the last few moments before the sun sets. The golden hour starts at about 5 pm and our view is spectacular. Great time for a little snack and some wine and beer on the deck. Yum. Nothing beats a good glass of wine in this surrounding. 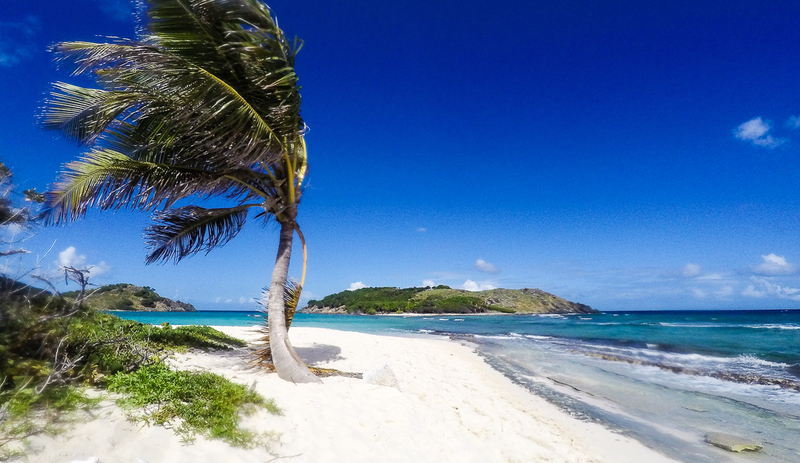 Sandy Cay, Sandy Spit, Little Jost & Big Jost, Diamond Cay, Tortola and in the back we even see St. John. Pretty amazing spot. The sun sets at 6 pm behind the hills of Tortola and that is the perfect time to go get ourselves a painkiller ashore. It is dark when we take the dinghy back to the boat. This is my first time out on a boat at night! I love, love, love what I am seeing! The sky is filled with stars. It was such a clear night. I count millions of lights. The lights of the other boats reflecting on the water and the lights in all the hills ashore, it all is so, so pretty. Eating on a sailing boat. I prepped the food at home so I made it easy for myself. Who doesn’t like a good BBQ? Just one slight problem. I wasn’t aware that every time you go out sailing something will break. Luckily not something massive broke, it is just the BBQ. Plan B: bake the massive amount of meat in a small pan in the camping kitchen. When I was young we went camping a lot and this brought up memories, which made it fun. A day of sailing makes me sleepy. Or was it the marihuana? Well, both had their impact on me so it is time to end the beautiful day. I must say even though it is a tight space in this boat, I have a good night rest. Sebastiaan not so much, he is tall. For once it is an advantage for me to be so short. Waking up with the sun rising above the islands is pretty amazing. I understand why people like sailing. Sailing isn’t luxury at all but I like to bathe in style! What better way to start your day than to relax and become all zen in your very own natural whirlpool? Bubble Pool beats every spa. Just a short walk between the mangroves and a gentle climb up will get you there. 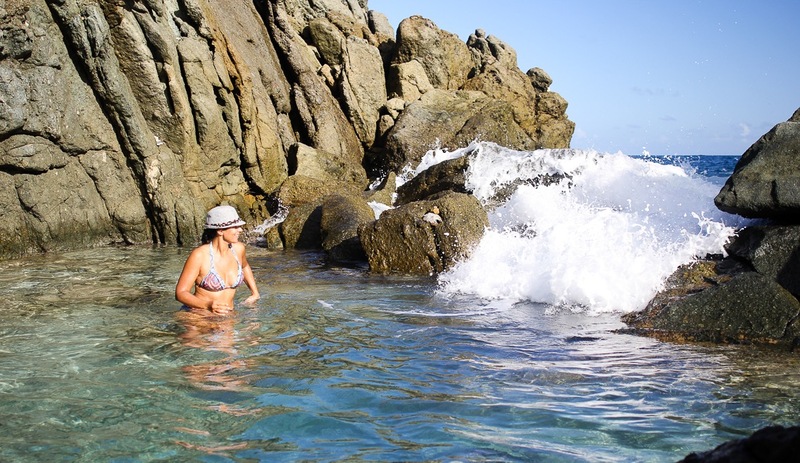 When the swell is up the waves crash into the rocks and break apart in this small natural pool. The wave’s remnants make the water fizzy and bubbly like a shaken soda can. I must admit that sailing isn’t so bad as I thought it would be. And just before I set my feet on the ground with this idea, reality struck! The clear blue sky we had seen the last days transformed in front of our eyes into a grey massive cloud. From the boat, you can see the weather changing but you can not avoid it. We are heading straight towards the storm with heavy rainfalls. It is a beautiful sight though when the rain pours over sea and land. It looks like a curtain of rain with rainbows everywhere. The BVI has an amazing way of making everything look pretty. We feel the wind gusts and we know there is no escape. This is what sailing can also be: soaking wet trying to keep control over the ship. This is not my cup of tea. I like good weather sailing and none of this nonsense. Luckily I am in reach of a warm shower as my drop-off is in West End. The guys still have a long trip upwind in the Sir Francis Drake Channel to Road Town with the heavy weather. How was my first sailing experience? I wouldn’t want to have missed this trip. My best moments were stargazing at night and the beautiful places we were able to visit. My worst moment was the storm. To be completely honest, I loved the experience. But I do think I am more of a motorboat girl… Thank you, David, for the amazing time and great memories!